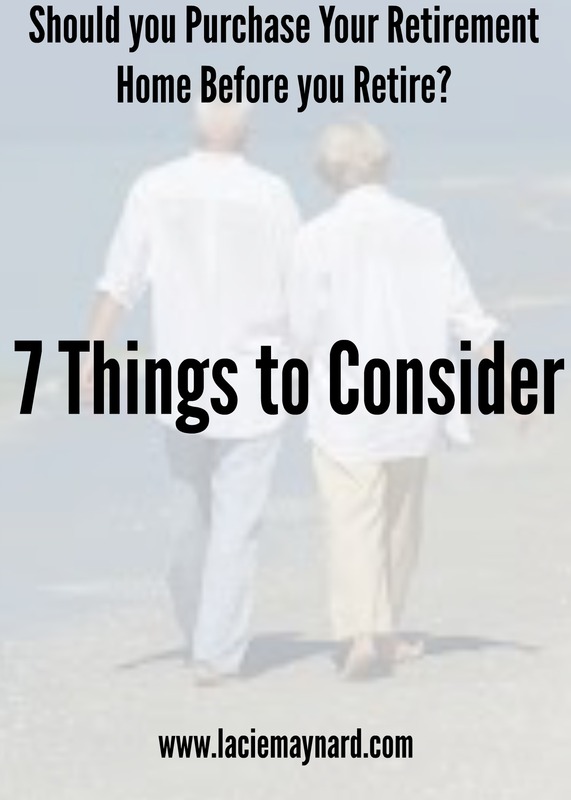 Is buying a retirement home early the best way to plan for your future. Some financial experts say to start planning on purchasing your retirement home before you stop working. Most suggest at least 5 to 10 years before you plan on retiring. A mortgage approval could be more difficult to obtain without an income. A possible generation of rental income. More cash flow for renovations. A head start on paying off your mortgage. Ability to plan better for future expenses. However, you need to be aware of the risks of tying up money and perhaps losing flexibility with a second home purchase. Will this property have a resale value based on the location, community amenities and floor plan? Will the home be low-maintenance? Have you taken inventory of your current and future finances? Have you taken into consideration extra maintenance costs, taxes, or HOA dues? Will you be in your retirement home part-time or a year-round home? Have you checked to see if neighboring stores/restaurants don’t shut down during the off-season? Before you dash off and purchase a home, do some research. Actually rent a place on the beach before you move to the beach or take a few trips in a RV before you sell your home and tour the nation in one. It’s smart to test out the waters before you dive in. Buy a home built for aging. Don’t lose your independence because you didn’t plan ahead. Some things to include are: User friendly door/plumbing handles or seats in showers, a no-step entry, a bedroom/kitchen/bathroom on the bottom level if you have more than one story. Transportation in times when you no longer drive. Is there city provided transportation or are you within walking distance to places that you will need on a weekly basis? Will you have relatives or friends nearby to help? Is there health care, pharmacies and a major hospital nearby? As you age, these will be necessary. Is the economy in the area sustainable? If you should need to get a part time or seasonal job, will that be an option where you are going? Can you comfortably live in your chosen retirement community on your retirement income? You don’t want to live month to month without being able to enjoy where you are. What type of amenities are offered and geared toward your age group? Are there events that are free? Libraries or community centers with free resources? Activities that don’t cost much? Are these activities geared toward your likes and enjoyments? Can you tolerate the weather? Will you be able to endure sweltering summers or icy winters? Is this area prone to storms, hurricanes, flooding, tornadoes or forest fires? Are you prepared to deal with possible weather occurrences? Socializing. Will you leave family and friends or move closer? Do you have connections? Help if needed. Maintaining your home and dealing with chores can become difficult during an emergency as well as day to day. Do you have a plan in place? For instance: have you planned in your budget for lawn care? Children and grandchildren will become important in your choice of where you will retire. How close in proximity will you be to them or have you allowed in your budget money to travel? The type of home and community you choose when retiring will make all the difference. Both should support independent living as you transition. You can still be an active adult and planning ahead will ensure an active lifestyle. The more “age-friendly” your home is, the less time and money you’ll need to put into it when it becomes your principal residence. As always, if you should need help in planning for your retirement and you’ve decided that the Alabama Gulf Coast is for you, we’ll be happy to help.If you happen to be in our area and would like to take a look at a property, we’ll be more than happy to assist you. Give us a call, text, or email today.